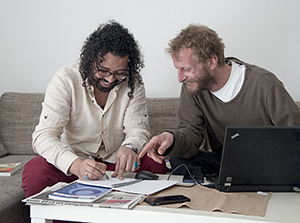 Omar Al-Jaffal & Johannes Hempel - wearedoingit e.V. Omar Al-Jaffal is an iraqi journalist and poet. His poems have been translated into seven languages. He is a member of “The Iraqi House of Poetry” and a published of the literary magazine „Bayt“. In 2017 he was awarded the Mustafa Al-Husseiny Prize for Best Young Arab Journalistic Article. He is currently a fellow at Heinrich Böll Haus, Langenbroich/Germany – a residency for writers in risk. Johannes Hempel is a photographer shooting a wide spectrum of themes. He was involved with projects like „Fantastic Streets“ and the „Dirt Ollies“ Skateboardtour to Mongolia in 2004, which evolved from his mind.